Hey guys! 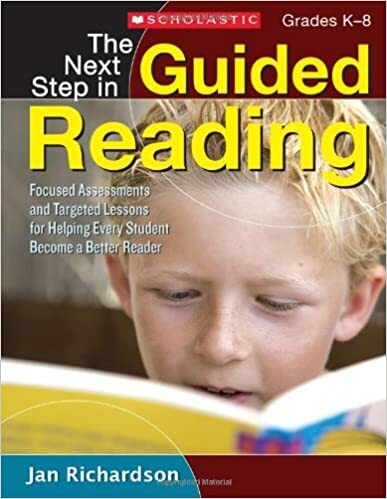 It's that time of the week again where I am teaming up with my #GuidedReadingGals to share another chapter of this amazing book, The Next Steps in Guided Reading. This week we are focusing on Chapter 4: Early Guided Reading. Head over to Beverly's page for a full overview of Chapter 4. This chapter focuses on students on reading levels D-I. By the end of Kindergarten, our goal is to have students reading at a D level. However, I have had many students surpass this and were my in my Early Guided Reading Group. At first this group was harder for me to plan activities for because I wanted to challenge them but did not know how. This book tells you exactly what you can work on with these students. Before you put students into these Early Guided Reading groups, make sure that the students can read and write 20-30 sight words. This will help with fluency. Each Guided Reading Lesson is broken up into two days. I usually break mine into three days just because of the attention span of a Kindergartener. But do what works best in your classroom and for you. B-M-E - Students take turns telling what happened at the beginning, middle, and end of the story. A quick easy way to do this is to have the students fold a paper in thirds and illustrate or write what happened in the beginning in the first column, what happened in the middle in the second column, and what happened at the end in the third column. Sometimes we will even create a quick flow chart together for another visual representation. Somebody-Wanted-But-So - Students summarize the story by recalling the characters (somebody), the character's goal (wanted), the conflict (but), and the resolution (so). The goal of this strategy is to have the students summarize the story in a sentence or two using this framework without prompting. Five-Finger Retell - Students will hold up there hand and use their fingers to retell five story elements. Make Predictions - Students will predict what would happen if there was another page in the book. What would happen next? Problem-Solution - Students will describe the problem and explain how it was solved. Character's Feelings - Students will compare how the character felt at the beginning of the story, middle of the story, and at the end of the story. This is definitely an element of my Guided Reading Groups that I felt I was leaving out or lacking in. These suggestions that Jan Richardson are exactly what I was looking for. I am going to try to implement as many of these as I can in whole group and in my Guided Reading groups. Now head on over to Beverly's blog to read more about Chapter 4!